CH Technologies offers the new Blaustein Atomizing Modules (BLAM), a series of atomizers that offer very attractive functionality for the chemical research and aerobiology industries. The BLAM relies on a new, patent pending, design which allows for a more efficient generation of aerosols than other existing devices in both its single pass and recirculating configurations. This innovative approach will allow researchers to produce a quasi-monodisperse aerosol at very high particle concentrations. Featuring the universality for which CH Technologies' products are noted, all BLAM units are modular and easily integrated with all CH systems. Advancing its versatility, the BLAM takes modularity to a new level of product performance. With interchangeable plates, it can perform the tasks of multiple nebulizers. By interchanging one or two parts, the atomizer can accommodate liquids of varying properties to produce aerosols in specific ranges of size and output concentration. 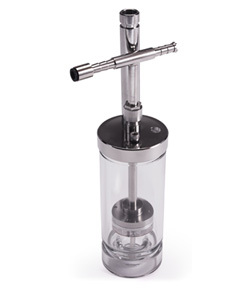 The business end of this device is its nozzle, which can easily be adapted to existing nebulizers. Like all CH products, the BLAM is fully backed by our team of engineers and technicians who are ready to provide service and support. Noteworthy for its consistency, modular versatility, easy system integration, and comprehensive technical support, the BLAM is destined to be a fixture in the optimized research facility. Click here for details regarding the advantages in viability of the BLAM over the Collison.